We’ve all reminist at one point in time or other, about a product or brand that once dominated our youths, and wondered -what happened to them? Only later to see Company X pop up on our feeds with the heading "Company X files for bankruptcy". The protagonists of these stories always come out looking dated- failing to recognise business and descending into irrelevance. But on second look the idea that intelligent, ambition individuals with the drive to manage a large organisation could simply overlook something so obvious to the average Joe, seems too simplistic to be true. Great companies do not fail because of a single decision or trend. The roots of disruption are always more complex than that. So, what are we missing and could we be learnign from their mistakes? The story is, in 2000, Reed Hastings, the founder of a fledgling company called Netflix, flew to Dallas to propose a partnership to Blockbuster CEO John Antioco, and his team. The idea was that Netflix would run Blockbuster’s brand online and Antioco’s firm would promote Netflix in its stores. Hastings, got laughed out of the room and as the saying goes, he who laughs last laughs longest and we all know what happened next. 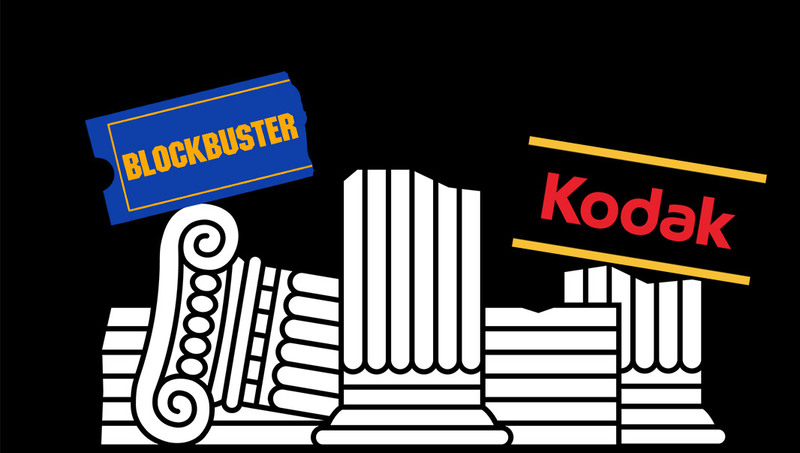 Blockbuster was blind to the threat that Netflix presented and descended into bankruptcy in 2010. Netflix is now a $28 billion-dollar company, about ten times what Blockbuster was worth. However, the truth is much more complex, as former CEO John Antioco, explains in a Harvard Business Review article, after initially dismissing Netflix as a niche player, his team soon saw the flaw in their modelling - it earned an enormous amount of money by charging its customers late fees, which had become an important part of Blockbuster’s revenue model. The ugly truth—and the company’s achilles heel—was that the company’s profits were highly dependent on penalising its patrons. At the same time, Netflix had certain advantages. By eschewing retail locations, it lowered costs and could afford to offer its customers far greater variety. Instead of charging to rent videos, it offered subscriptions, which made annoying late fees unnecessary. Customers could watch a video for as long as they wanted or return it and get a new one. Eventually, Antioco and his team came up with a strategy that began to beat Netflix at its own game. It was called Total Access and it allowed customers to rent videos online and return them in stores. It immediately gained traction and before long Blockbuster was adding subscribers faster than Netflix was. What went wrong? Well investors didn’t like the costs associated with the program (about $400 million) and franchisees were wary about the threat to their businesses. Things came to a head in 2007, when after a salary dispute, Antioco was fired. His replacement, Jim Keyes, reversed the strategy to focus on the retail operation and the company went bankrupt three years later. The simple explanation turned out to be not so simple after all - the reality is that the senior leadership came up with a viable strategy but couldn’t manage the internal networks of forces that derailed it. That’s not so simple. Kodak was a pioneer from its inception in 1888, the company's founder George Eastman had invented roll film, which replaced photographic plates and allowed photography to become a hobby of the masses. Kodak did not quite own the 20th century, but it did become the curator of our memories. Innovative in nature, the company was in fact the first to create a digital camera in 1975. A young engineer at Kodak named Steve Sasson produced an eight pounds camera able to produce pictures at 0.01 megapixels. He estimated at the time that it would take 15 to 20 years for the technology to become viable. The pundits’ version of what happened next is predictable. Being a set in its ways big company the firm failed to pursue digital photography. New upstarts took over the market and prospered, while Kodak vanished into irrelevance. Resulting in the company filing for bankruptcy in 2011. Once again, the truth is more complex. The company did, in fact, pursue the digital photography business in a serious way. In fact, its EasyShare line of cameras were top sellers. It also made big investments in quality printing for digital photos. The problem was that it made most of its money on developing film, a business that completely disappeared. It’s tough to say what Kodak could have done. The only real solution would have been to invent an entirely new business that could replace its cash cow. That’s easier said than done. Learn from the mistake not the fairytale. In both of the above cases, it was not a lack of insight or ambition that lead to their downfall. Blockbuster shows that a strategy isn't enough, you have to effectively manage internal networks so that the strategy doesn't get derailed. Kodak shows us that it's more important to prepare than adapt. Digital photography could have never replaced the photo developing business. It had 20 years to invent a new market, but never did!